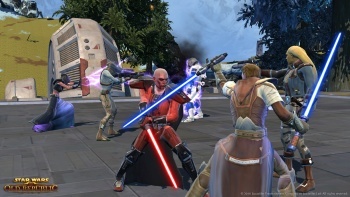 A lucky few might already be taking a crack at BioWare's upcoming Star Wars MMORPG. The Star Wars: The Old Republic community has been in a fervor over nearly confirmed rumors that the game has entered a public closed beta phase for this weekend only. The game isn't expected until mid-2011 at the earliest, but those with the force in them may be playing as we speak... err... write... as I write... and you read. They're playing it now is what I am saying. BioWare has not confirmed the beta, but rather than a denial, Star Wars: The Old Republic community manager Sean Dahlberg wrote in this forum thread: "Thanks for the information and it's definitely interesting that people are posting about our Game Testing Program. We don't have anything official to say at this moment." He also said that members of the beta were only allowed to say that there is a beta, and that they are in it, if one were to be ongoing. An image capture of an alleged email invite was posted on Massively which says: "You have been invited to specifically test Korriban where you can play as either the Sith Inquisitor or Sith Warrior between the dates of June 25 through June 27." If it's a fake, it's a well made fake. Personally I'm excited because this means we're finally getting closer to the point where we find out if the hype behind this game pans out. There are very high hopes for The Old Republic, what with BioWare's amazing development history combined with a gargantuan amount of EA's money and the Star Wars universe. Though we've already gotten a hands-off impression of the game's features at E3 2010, it all comes down to whether The Old Republic can pull off its goal of changing the MMORPG into a more story-focused experience rather than an endless grind-fest to acquire new loot and a parrot pet. A small, slightly evil part of me is hoping somebody breaks NDA and gets us some new information.